Cookies and Milk. | Oh Look! It's A Blog! I was really set on doing this pic with a sad face and burnt cookies, but I couldn’t find any cookies that I liked. So it turned into just a messy flour on my face photo. 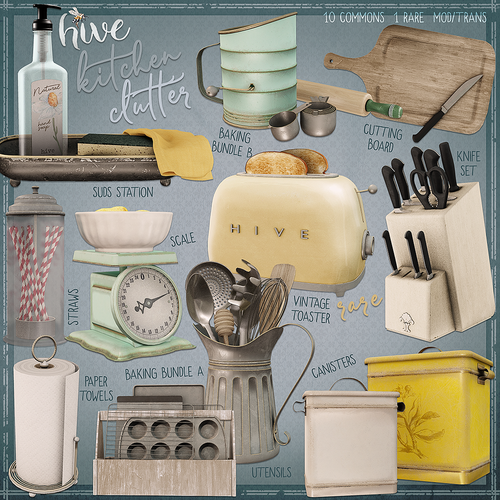 I really love clutter items as I think they help make a SL home feel ” lived in “. I actually used all these items in my current kitchen set up, so there’s a bunch of pics below. You can see the HIVE full key HERE. This entry was posted in iheartslFeed, Uncategorized and tagged 8f8, Amala, Apron, Baker, Baking, blog, Cook, Cookies, Decor, Disorderly, DRD, Elua, Flour, Glam Affair, Hive, Home, Ionic, Kitchen, Mess, OMEN, Pilot, Plethora, Sari Sari, Second Life, SL, Soy, Stellar, The Epiphany, The Epiphany Gacha, Tres Blah, Trompe Loeil. Bookmark the permalink.